Yesterday started with the ladies all getting together in their preparations for the day's nuptials. With an 11:00 AM check out time this left us guys with some time to kill before the ceremony so we did what any respectable men who are turning into their fathers would do. 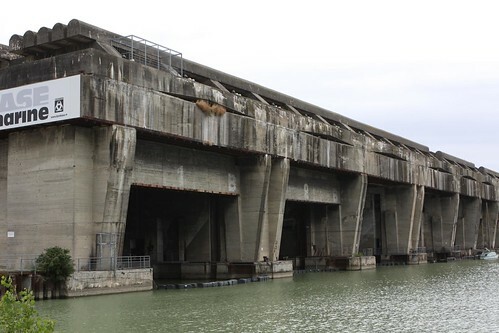 We found a World War II German submarine base and explored it! Unfortunately it seemed to be closed for the day. This meant we stumbled up a completely unlit staircase until we wound up in some administrative office before turning around and abandoning our mission. Creeping around a Nazi submarine base in the dark is a little scary even if presently it is being used only to house art exhibits about the Spanish Civil War. 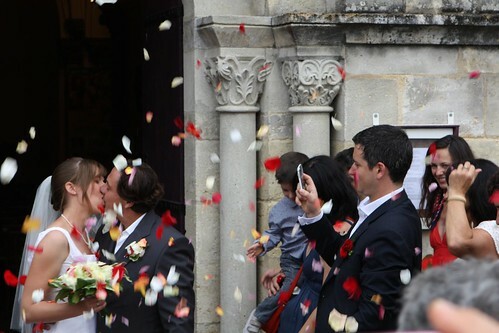 French wedding ceremonies consist of two parts: a civil ceremony and a church ceremony. The civil ceremony takes place in the mayor's office with a picture of President Sarkozy and the mayor wearing a sash of the French flag. 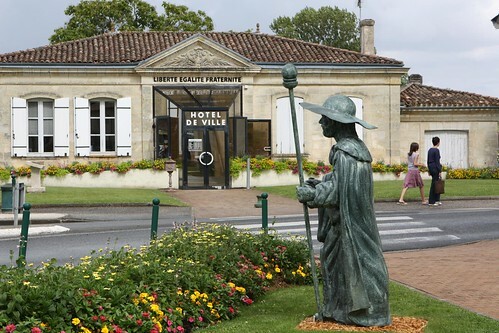 Oh, and there's a statue of a wizard that stands guard outside. The church ceremony takes place inside a church with more wizard statues. I feel that this town is very well protected against potential dragon invasion. 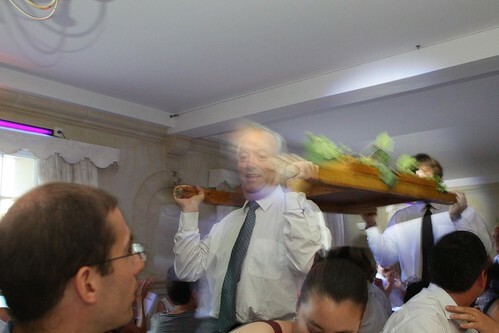 There is a part of the ceremony where they play a special song and two men bring out the roast veal on a litter like some sort of king. A delicious roasted king. 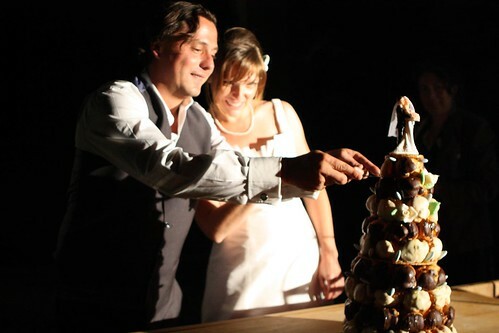 At the end, instead of wedding cake, they bring out a croque en bouche which they break apart by hand while fireworks shoot off in front of them. After much eating and drinking, around midnight the dancing starts. So, basically, a French wedding is superior to an American wedding in every way. 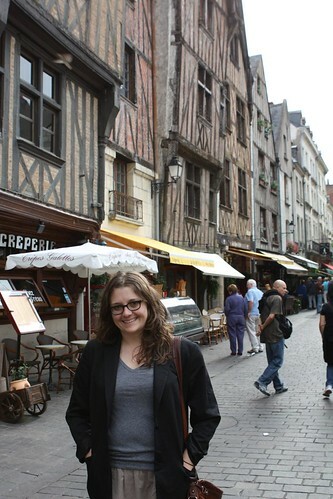 This afternoon, after the post-wedding brunch, we packed up the car and headed for Tours on our way back to Paris. The group of us went out for crepes and cider and were served by a woman who clearly hated us for some reason. All of us had fantastic crepes except for Jen. The crepe she ordered had a weird ham (or sausage) in it that looked like sliced shallots and seemed to suffer from boar taint. Boar taint is an unfortunate smell and taste uncastrated male pigs sometimes suffer from. 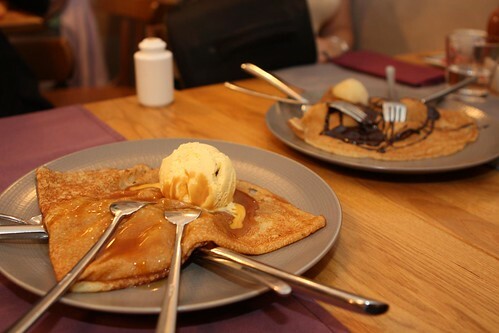 We tried to make it up with some dessert crepes after the meal. All of us have been taking turns with various forms of sore throat and general exhaustion from the pace of the past few days and toward the end of dinner it was my turn to return to the hotel room and lie down for a bit. After a while it passed and Jen and I went to sit in the square by the hotel in Tours and relive her trip to France when she was sixteen. For me it involved drinking some green tea. 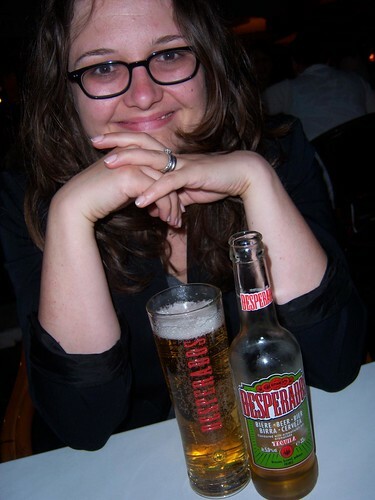 For Jen it involved a redemption crepe and a Desperados beer which is a beer with tequila in it that is made in France of all places. And that was our abbreviated trip to Tours. 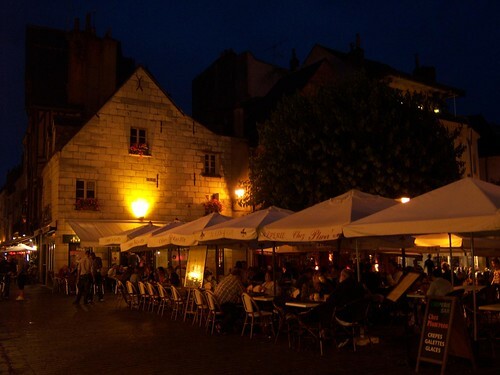 Much like Dijon it as just a quick stopover on our way through France. 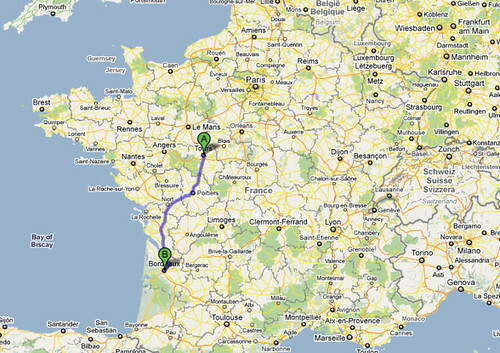 Tomorrow we begin the final leg of our journey to Paris. After about 2,500 kilometers our Tour de Tours and Tour de France will draw to a close. What wonders will await us there? Hopefully more fun adventures and great food.